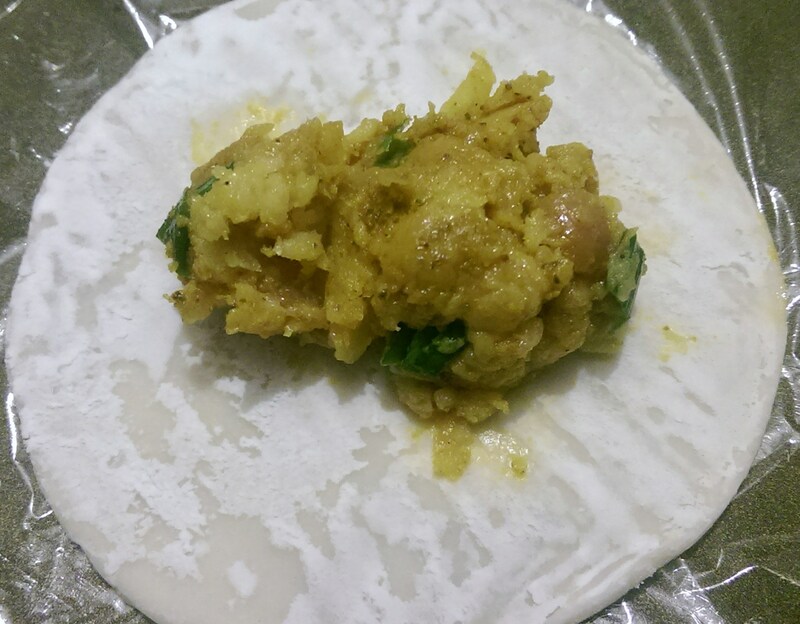 Chicken Tikka Potstickers: the dumplings with a twist! 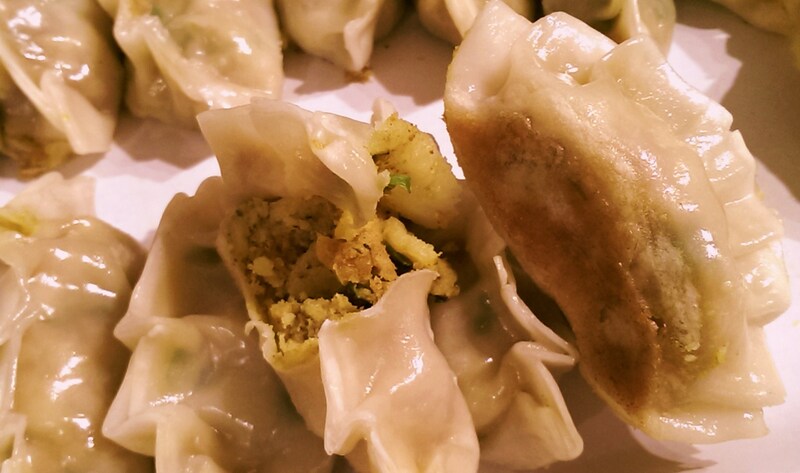 I have previously posted about potstickers/dumplings/gyozas before but for this recipe I have used the basic idea of the potsticker and given it a South Asian twist! Chinese potstickers are traditionally served with a milder flavours in comparison to spicy South Asian cooking (as with a lot of Chinese cooking the flavours are simple and subtle) and the dumplings served with a simple dipping sauce, usually based on soy sauce and vinegar. Taking inspiration from the was South Asian samosas are served, I decided to add a little spiciness to the filling of the potstickers as well as serve them with a couple of punchier dips! 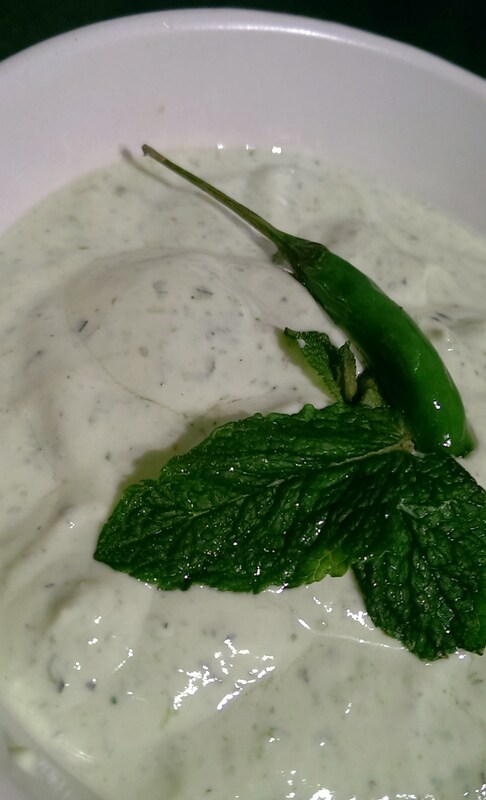 Mix the chicken with the Tikka paste and allow to marinade for a few hours of over night. Mix the raw chicken with crushed potatoes and leeks and add a little salt. Wrap the dumplings using about 2 tsp of filling per dumpling. 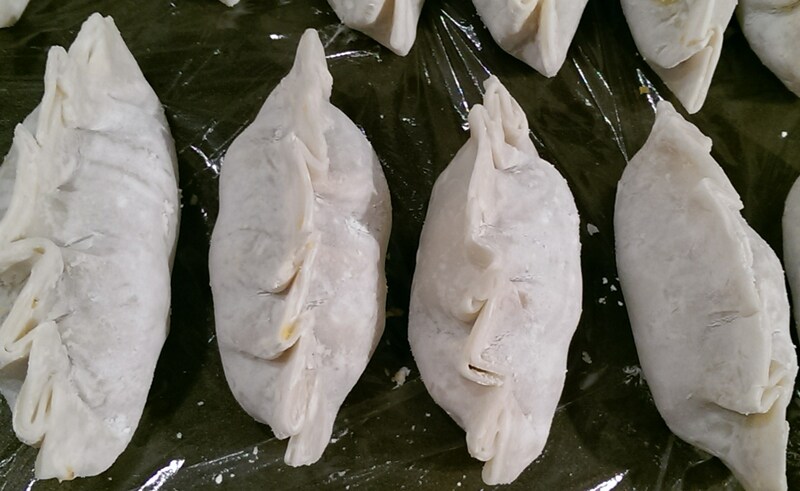 Line a couple of plates or baking trays with ling film to put the dumplings on to avoid them sticking the plate. make sure the dumplings aren’t touching as they will stuck together. You can also stick them straight into the freezer on the tray/plate then stick them into freezer bags for later use. In a heavy based sauce pan that has a lid or wok, add the oil and warm up. Add the dumplings into the pan, fairly close together, completely filling the pan but with a little space between each dumpling as they expand during cooking. Fry for a few minutes until the bottom of the dumplings have browned a little. Now it is time to cook the filling, so add some water to the pan (about 1 cup), cover with the lid and steam for 5-10 minutes on a low heat (until the filling is cooked through). If there is still water left in the pan, increase the heat to evaporate the remaining water and crisp up the bottoms. If cooking from frozen, no need to de-frost them. Just stick them straight in the pan and steam for an extra 5 minutes. Mix everything together and add salt to taste, simple! I made a batch of these and froze them for future meals when there is no time to cook or I’m too tired. Today was that day! The filling was nicely spiced and very much reminiscent of the taste of chicken samosas but a lot lighter since they aren’t deep fried. The potatoes in the filling help to keep it all quite dry so there is less risk of the dumplings bursting, however it also means that dips/chutneys are very much necessary! During my childhood, my parents were keen to ensure my siblings and I retained our culture, mother tongue and heritage. As second generation migrants living in the UK there was always a need to balance my two identities; though not without the occasional volcanic eruption! I attended a Sunday supplementary school to learn to read and write Chinese. This took place from 1-3pm each week and was attended by hundreds of children just like me, my sister and my cousins. A regular ritual for my family was to go to China Town and at 12pm for a dim sum lunch before we then rushed over to school. In Hong Kong, dim sum is traditionally served throughout the day.From early in the morning for breakfast right through to late afternoon for late lunches. ‘Dim Sum’ (點心) translated means ‘Touch of the Heart’. If you’ve read my ‘About’ page, you’ll know that my name is Sam (心) so you’ll see that I have a natural affinity to this delicious cuisine! Dim Sum is sometimes described as ‘Chinese Tapas’. You get lots of small dishes served in the middle of the table for all to share. The great things about Dim Sum is that the more people you have around the table, the more variety you can order. It’s a great way to have a lazy lunch with your friends, ordering as you go, washed down with plenty of jasmine tea. 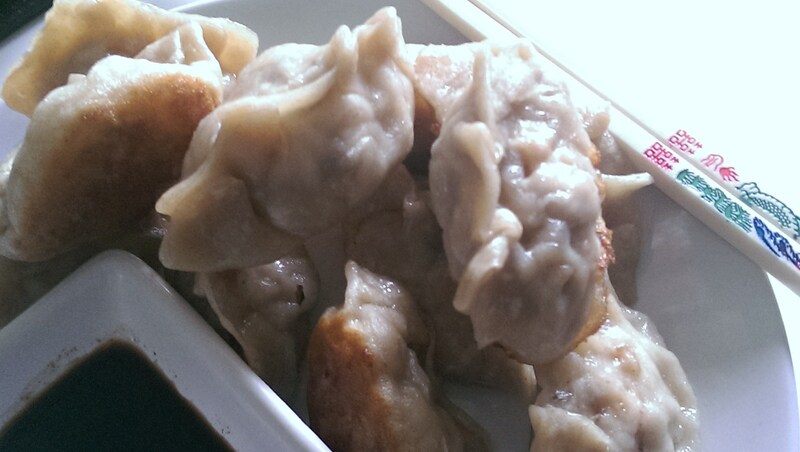 Pot-sticker, Gyoza, Mantu, Dumplings etc. come in many guises. It’s an amazing food that many cultures and countries have their own versions of. Basically a disk of dough stuffed with some form of meat or vegetable filling, then folded and sealed. They can be steamed, boiled, pan-fried or deep fried. The possibilities are endless! I regularly use shop bought dumpling pastry when I’m making them at home. They are fairly cheap and very convenient! In the early days of our relationship my partner wanted to show off the dishes from his home country (Afghanistan) and taught me how to make ‘Mantu’ and ‘Aushak’. Aushak are basically a dumpling filled with cooked leeks/scallions/spring onions, and boiled or steamed. 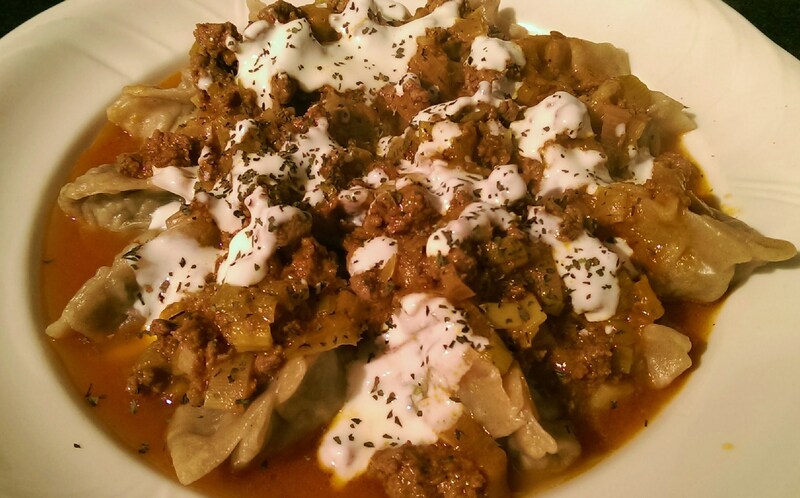 Mantu are a meat version made with ground or minced lamb/beef. 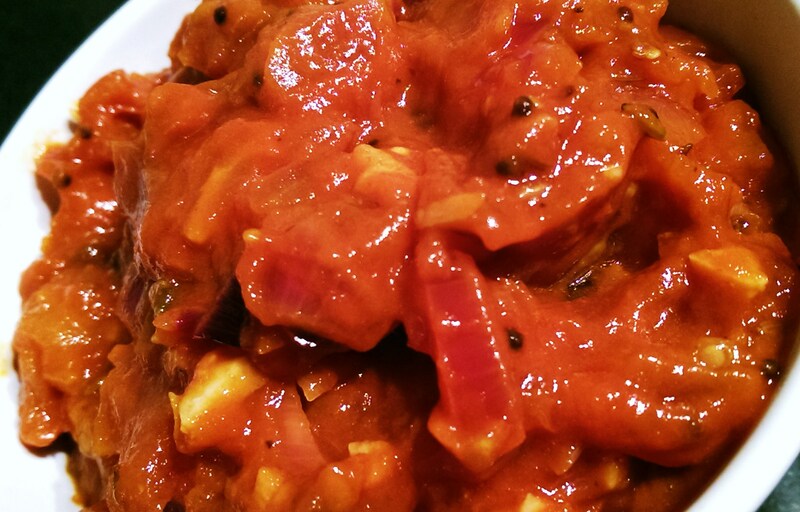 They are then served with a meaty or lentil based sauce. It seems that these Afghan dumplings were brought to the country by Mongolian horsemen when they were invading the country. 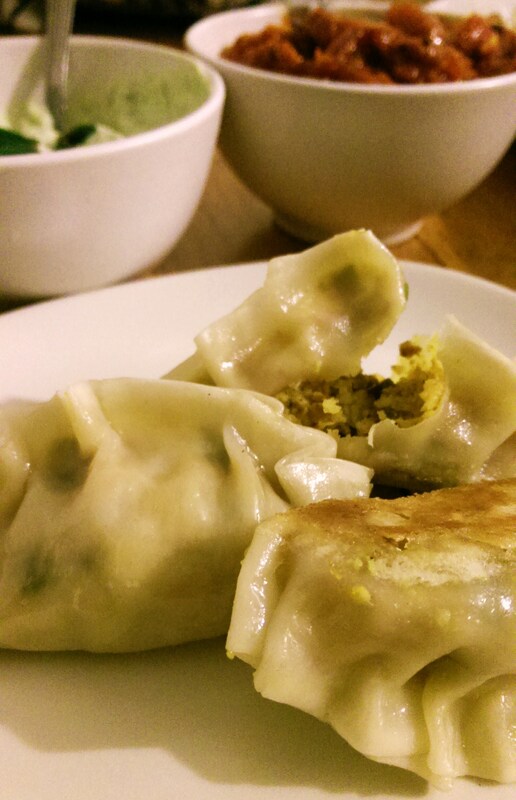 Afghans have adapted the dumplings and added spices and stronger flavours to suit the Central Asian palate. A very different way of serving dumplings to the basic Chinese pot-stickers that are served plain with a light dipping sauce. Dumpling making is time consuming but worth the effort. So today I have made a big batch. I’ve decided to try and make my own dumpling dough and turned to Christine again for her wise advice: Home made dumpling wrappers. 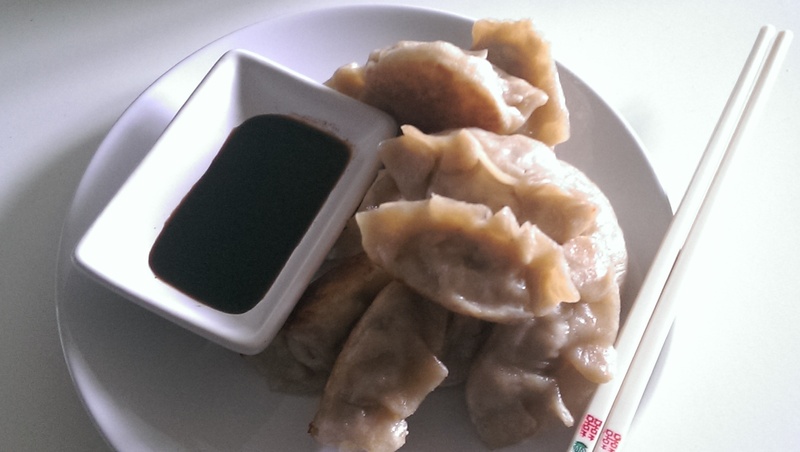 From one lot of dumpling dough I made three varieties: Prawn and shitake mushroom pot-stickers, Aushak, and Banana gyoza. This was mainly to test out the dough to see what kind of cooking methods it will stand up to. The pot-stickers were fantastic! For the filling, I processed raw prawns/shrimp with rehydrated shitake mushrooms and added sesame oil, salt and pepper to taste. I also added some cornflour to help soak up some of the juice during the cooking process. For the Aushak I made the filling, wrapped them, then stuck them in the freezer on a baking sheet for another time. 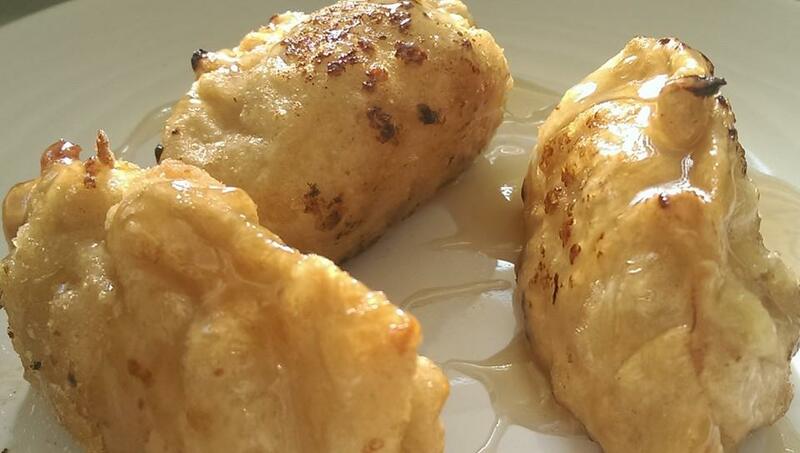 The banana gyoza were stuffed with mashed banana then deep fried. The pastry didn’t like the wet banana much as a couple of them burst during cooking. However, served with a coconut caramel recipe that I found, they were to die for! For one gyoza I also added a spoonful of Nutella (yum!) but found the overall taste to be too sweet and sickly. I think next time I’m going to add a little sea salt to the caramel to balance out the flavours a little.